In 2014, I was outraged that more than 80 percent of senior bureaucrats at the Veterans Administration were awarded bonuses, even though this is the bloated bureaucracy that caused the death of many veterans by putting them on secret waiting lists. This, I argued, was a perfect example (in a bad way) of federal bureaucracy in action. In 2015, I put together a version about bureaucracy in action at the local level, noting that the number of firefighters has climbed by 50 percent since 1980, even though the number of fires has declined by more than 50 percent during the same period. This year, let’s look at the overseas edition of bureaucracy in action. Our story comes from Italy, where there’s been a government shutdown. Though only in the town of Boscotrecase. And not because of an Obamacare-style budget fight, but rather because a bunch of the local bureaucrats got arrested for routinely skipping work. The mayor of a small town outside Naples had to shut down most municipal offices after police arrested 23 of his staff in the latest revelations of absenteeism in Italy’s public sector. Staff were filmed clocking in and then leaving to go about their personal business or using multiple swipe cards to register absent colleagues, police said, in scenes that have become familiar after numerous similar scandals. 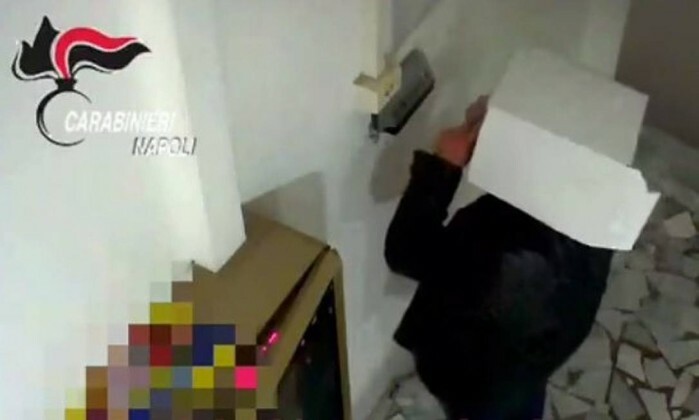 A police video showed one man trying to tamper with a security camera and then putting a cardboard box over his head to hide his identity before swiping two cards. Police arrested around half of all employees in the town hall offices of Boscotrecase following a weeks-long investigation that they said revealed 200 cases of absenteeism involving 30 people. …four major town hall departments had been closed on Tuesday due to a lack of staff. Those arrested, accused of fraud against the state, included the head of the local traffic police and the head of the town’s accounting department. The workers, whose arrest comes amid a government crackdown against absenteeism, have been suspended from work for between six and 12 months and risk eventual dismissal. What I want to know, of course, is whether the bureaucrats were suspended with pay or without pay. If it’s the former (which would be my guess), how will their lives be any different? They’ll be goofing off at home while getting overpaid! No wonder Italy is in a death spiral. P.S. The Bureaucrat Hall of Fame is comprised of specific government employees who have perfected the art of slacking (such as the Italian doctor who legally worked only 15 days in a nine-year period). That being said, I’m tempted to give adjunct membership to the entire local government of Boscotrecase. P.P.S. Switching topics, the unpalatable choice between Donald Trump and Hillary Clinton does have a silver lining. It’s generated this clever make-believe announcement from the British Monarch. Her Sovereign Majesty Queen Elizabeth II will resume monarchical duties over all states, commonwealths, and territories (except North Dakota, which she does not fancy). Your new Prime Minister, Theresa May, will appoint a Governor for America without the need for further elections. Congress and the Senate will be disbanded. A questionnaire may be circulated next year to determine whether any of you noticed. 4. You will learn to resolve personal issues without using lawyers, psychics or therapists. The fact that you need so many lawyers and therapists shows that you’re not quite ready to be independent. If you can’t sort things out without suing someone or speaking to a therapist, then you’re not ready to be a sovereign nation. 11. You will cease playing American football. There is only one kind of proper football; you call it soccer. 14. An inland revenue agent (i.e. tax collector) from Her Majesty’s Government will be with you shortly to ensure the acquisition of all monies due (backdated to 1776). Reasonably clever. Reminds me of the somewhat un-PC humor a British friend sent me on how different countries respond to terrorism. By the way, I’m not sure the part about needing a permit to carry a vegetable peeler is a joke. After all, we’re talking about the country where you need an ID to buy a teaspoon.